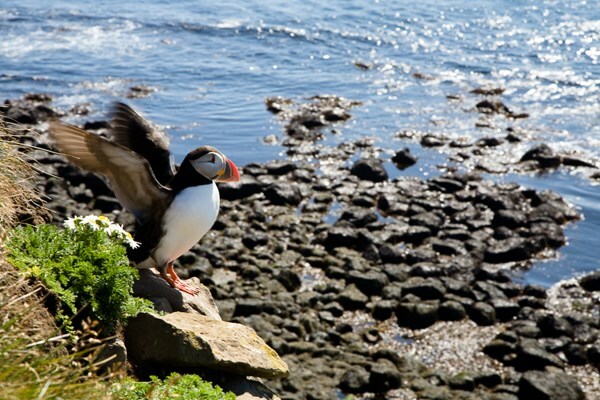 The bird watching season in the Westfjords of Iceland begins in April, with May and June offering the best opportunity of seeing the widest variety of species. Throughout the season you see the birds arriving and settling, nesting (preparing and building the nests), preserving their eggs, feeding the baby birds and finally coach them for flying and coping with the real world. Daylight is long at this time of the year, up to 24 hours, so you will have plenty of time to devote for sheer enjoyable birdwatching at different stages of the season. Látrabjarg is the largest seabird colony in the Northern Atlantic. It is claimed to be the best place in the world to photograph puffins. Many other species are found in Látrabjarg cliff such as the Razorbill, the Brunnich’s Guillemot, the Common Guillemot and the Fulmar, just to name a few. Látrabjarg is by far the only place in the Westfjords where rare birds can be found. The local guide will take you to the best places in the neighboring area to watch and photograph species you would not find on your own i.e. the White Tailed Eagle, the Common Loon etc. Westfjords Adventures and Westtours offers both private tours and private group tours.